The first half dozen or so chapters are about her childhood and the extreme poverty she grew up in. This sets up the explanation for why she starts working as soon as she becomes a teenager, and why she eventually goes into domestic service, working as a kitchen maid and then kind of faking her way into a job as a cook. The commentary and matter of fact speech is engaging (for example, boys are still the same a century later; probably you could pick up some tips if you wanted; also I hunted up the cookbook on Scribd) and insightful. Her values were definitely different from what a modern reader would be able to relate to, but that is a sign of the times as Powell herself mentions frequently. She is also very upfront about the fact that her goal the entire time was to get married to someone who wasn't also in domestic service so she could quit working. 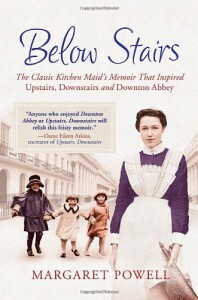 Hmmm... not much of a moral, but it is at least an unvarnished recounting of history from someone who was there and witnessed an interesting time of change - that is, the swift decline of domestic servitude as a primary career for the lower classes and change in what defined aristocratic culture. -- "I know I used to wonder why, when things were so hard, Mum kept having babies... You see that was the only pleasure poor people could afford. It cost nothing - at least at the time when you were actually making the children. The fact that it would cost you something later on, well, the working-class people never looked ahead in those days. They didn't dare. It was enough to live for the present." This is almost word for word the exact sentiment expressed by the woman who wrote the essay my high school English teacher gave us all copies of; it was about her impoverished circumstances in a small American town mid- to late 20th century. -- "My mother immediately remembered that she'd read an article in a newspaper about how all young girls disappeared as soon as they got to London and were never heard of again. It was well known, she said, that those women, and by 'those women' of course she meant prostitutes, originally were innocent young girls who'd gone to London in the same way that I was suggesting, and been lured away by promises of easy money and a life of luxury. I remember saying, 'Oh, don't worry, Mum. I'll tell them when I'm standing on the corner that I'm waiting for a bus.' That didn't console my mother." -- "Even nowadays when see an economic recipe and they say you cant tell the difference from the original, well probably you can't if you've never eaten the original, but if you have there's a vast difference." See: apple pie. -- "It's a sad fact that uniform does nothing for a woman at all, it just accentuates all the wrong bulges, but even the most insignificant male seems to look masculine when he's got a uniform on. Maybe because it's cut to show off whatever points he has got (I'm not being vulgar), I mean to accentuate them. They were, of course, delighted to be the centre of interest. What man wouldn't be if he had five or six females fluttering around him, plying him with biscuits, and cups of tea, and hanging on to his words with bated breath. Men are very susceptible to flattery. Even a man with a face like the back of a bus, if you tell him he doesn't look too bad, believes you. You can stuff men up with any old yarn. They believe anything. You've only got to gaze into their eyes, and sound as though you mean what you say. I've tried it so I know it's true." A lot funnier when you take into account all of the disparaging things she says about her own appearance and personality and her continually failed efforts with boyfriends. -- "The only thing that kept me and those like me from staying off the straight and narrow was ignorance and fear. Ignorance of how not to have a baby, and fear of catching a disease.. That's why so many deviate now because those two fears have gone, haven't they?" I love the contradictions, the hypocrisy in her very speech as the book progresses; it is very human. -- "It's a funny thing, but the less cooking you know how to do, the more competent you feel. It's only when you know how to cook that it worries you when it goes wrong, because when you don't know, you don't know it's gone wrong. The more experienced I got the more I worried. I soon realized when a dish wasn't perfection." I added white wine on a whim to the vegetables I was cooking with copious amounts of butter and garlic tonight and cooked it out. Turned out pretty delicious actually; good call in hindsight. Or perhaps lucky is the right word? Haha. -- "A month is a long time when people are unpleasant to you, and the two old dears, although I didn't make things any worse for them, resented that I could get out, that I'd got a future, and that they hadn't. They'd only got the past and that hadn't been too good." -- "I came to the conclusion that aggression only achieved results when it was allied to beauty or power. Well, I had neither of these desirable traits, so common sense should have taken over from there and convinced me that my position in life was just to be a sort of down-trodden housewife, one of the great army of housewives who've got aspirations, but never manage to do anything about it." Literally one of my greatest fears! -- "I think that [a parent] can be too ambitious. You educate [children], you send them into a social community of which they can't be one. People have the same herd instinct as animals. There's only got to be one that's different and they kick hell out of him." Although I edited it to fit the context of the particular chapter it was pulled from, the quote could also apply to Powell's life herself. She was educated enough to the point where she stood at the precipice of curiosity, and her voracious reading habits and natural intellectualism made her even more dissatisfied with her lot in life, which in turn fed into the negative interactions she had with many of her coworkers and employers.